Nell Blaine is a monumentally inspiring person in the history of artists, but she is rarely, if ever, featured in art history surveys. This is true despite the fact that 79 artists held an exhibition to raise money for her hospital bills in 1959, including Motherwell, the de Koonings, Freilicher, and Rauschenberg. She whipped polio and went on to create a vibrant, colorful body of work in oil and watercolor. Blaine was born in Virginia and moved to New York in 1942 to study under Hans Hofmann (1880–1966). 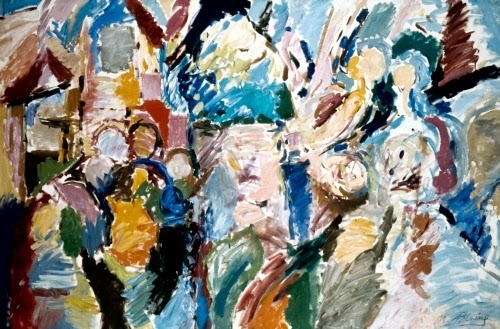 Hofmann was a mentor of sorts to some of the Abstract Expressionists. She was a member of the only group dedicated to abstraction during the Social Realist years of the Great Depression (1929–1940), the Abstract American Artists. Her early realist painting turned abstract under the influence of Mondrian, Helion, and Léger, all of whom worked in some type of geometric abstraction. In the late 1940s, she attracted the attention of Clement Greenberg, the art critic/essayist who marketed Abstract Expressionism. However, by the mid-1950s, she had returned to representation, developing a painterly and colorful style, focusing on painting from direct observation of nature or still life. Her particular passion was the depiction of flowers in pure colors. Her first solo show was 1953, and she was featured as a leading young woman artist in Life magazine in 1957. On a trip to Greece in 1959, Blaine contracted polio and ended up in the hospital in New York for eight months, some of that time in an iron lung. 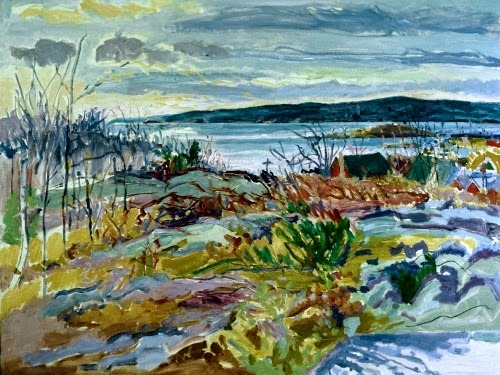 Although told in 1960 that she would never paint again, she trained herself to paint in oils with her left hand and watercolors and drawing with her right. Her primary subjects after that were sweeping cityscapes of New York and its environs, and of the area around Gloucester, MA, where she bought a home in 1975. She also lived and worked in Europe for months at a time. 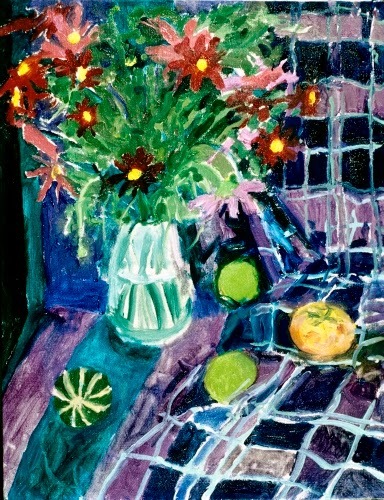 This still life is typical of her love of pure color, particularly cobalt violet. 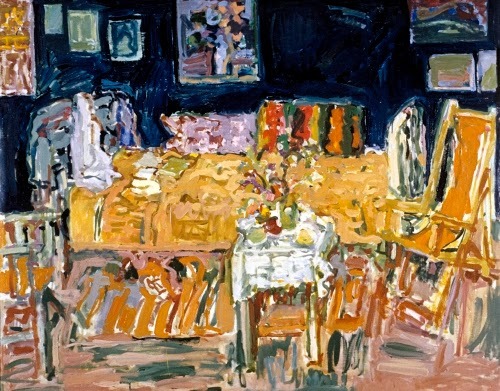 Her work of the 1960s through the 1980s recalls a trip she made in 1950 to Paris, where the work of Bonnard and Vuillard had a major impact on her. She thereafter studied 1800s French painting. While her forms are abstracted with loose brush work, they betray a certain tradition of compositional structure that goes back to Cézanne, the Nabis, and through Matisse. Her work is joyful and shows how she delighted in depicting the natural world. Her statements about color are demonstrated in her paintings! Here one sees the artist on the verge of returning to figuration and objects. Poor Clement Greenburg. I suspect that this was painted during her trip to Greece. Note how the forms are now firmly back in the representational arena. 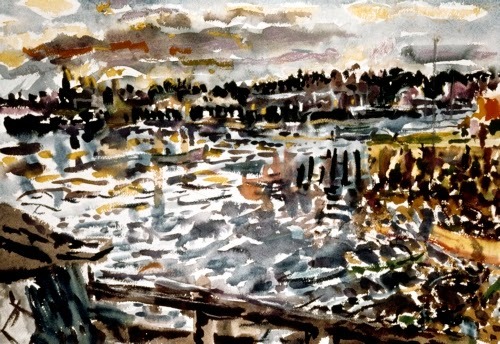 A view of the skyline in New York often painted by Blaine. This painting with its gorgeous bright colors certainly reflects Blaine’s enthusiasm for the wilds of Massachusetts after she bought the house in Gloucester.